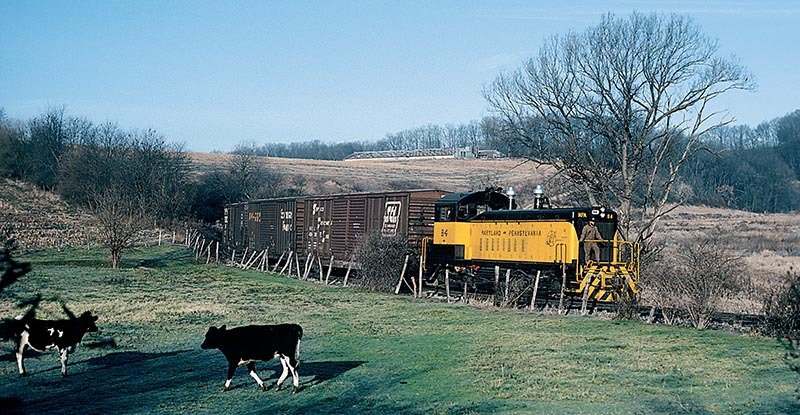 The calves are frightened by the Red Lion-bound train and hasten to distance themselves from the tracks in this photo from 1982. This dairy farm east of York exemplifies the agricultural heritage of the area and serves as a reminder of the role that the Ma & Pa had in bringing fresh milk to the big cities. On a gorgeous day this past summer, my friend Bob Wilt and I struck off for a day of photography in York, Pa. Our target was Yorkrail, the latest corporate successor to the Maryland & Pennsylvania Railroad. We were hoping to follow a train between York and Hanover or perhaps to Porters where Yorkrail interchanges cars with CSX, or even stopping by Spring Grove, home to Glatfelter’s paper plant. While in York, I reflected on the fact that none of the ex-Ma & Pa rail lines we were attempting to photograph were lines that had been owned and operated by the Maryland & Pennsylvania Railroad of history. The original Ma & Pa was a sleepy short line that was known far beyond its importance in the national or even statewide rail network. 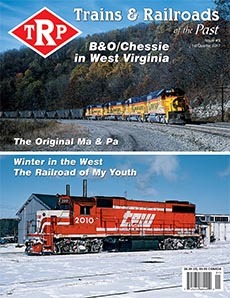 Its slogan “The Famous Ma & Pa” was emblazoned on locomotives, freight cars and signs. The slogan was no idle boast. 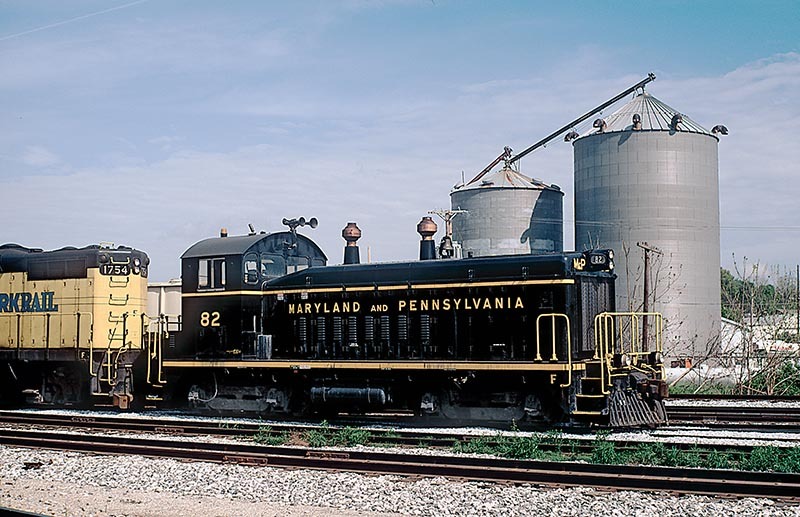 The Ma & Pa was incorporated in 1901 through a consolidation of the Baltimore & Lehigh Railway Company which ran from Baltimore, Md., to Delta, Pa., and the York Southern Railroad Company which connected York and Delta. Between its end points, the line meandered for a length of 77.2 miles covering a distance of 49 miles as the crow flies. Curves and grades abounded. 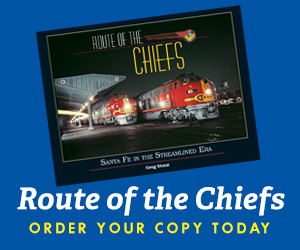 Can you imagine a 77.2 mile railroad with 476 curves and 114 bridges? That comes to 6.2 curves per mile and 1.5 bridges per mile. One can imagine the consequences for operations and maintenance. The rolling hills of the countryside were pretty and the dairy farms were numerous. 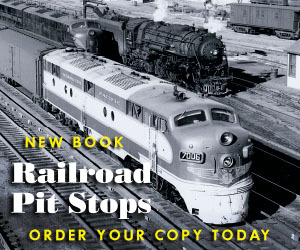 However, large or even modest-sized towns that could provide potential shippers during the age of American manufacturing were scarce along the line. Only two boroughs, Dallastown and Red Lion, were of any size whatsoever. Dallastown was reached by a short branch. The pace of operations was, charitably put, leisurely. In 1932, the morning passenger/mail train 3 from Baltimore was carded for a 7:00 a.m. departure with a scheduled 11:45 a.m. arrival in York. Mathematicians among us can calculate that the four hour and 45 minute trip resulted in an average speed at 16.2 miles per hour. To be fair, one could catch the faster train 7 later in the day which covered the same ground in four hours and 10 minutes, a breathtaking 18.5 miles per hour. The Ma & Pa’s tracks split the borough of Yoe, Pa. Roads and buildings surround the train on both sides. 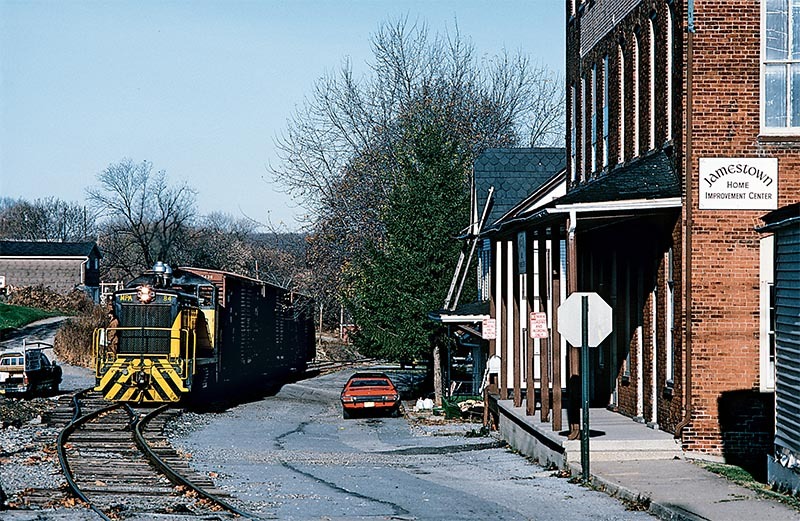 A crew member rides the pilot of the former Pittsburgh & Lake Erie unit, observing the town as the train passes through in this 1982 scene.